Intercontinental GT Challenge Powered by Pirelli’s 2019 world tour continues this weekend (March 28-30) at WeatherTech Raceway Laguna Seca where a record eight full-season manufacturers will contest the California 8 Hours. 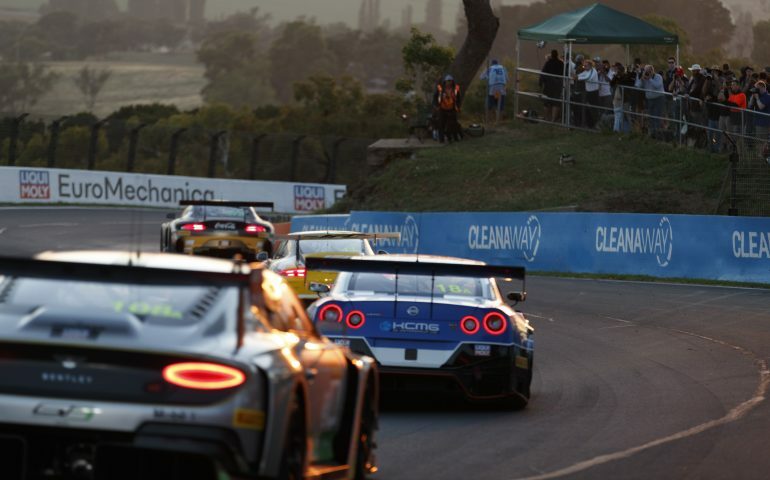 crews also remain together for this season’s second round following a thrilling opener Down Under at the Liqui-Moly Bathurst 12 Hour in February. Streaming coverage of the race will be available in Australia via the ICGT website. Just like every #IntGTC venue, WeatherTech Raceway Laguna Seca’s rollercoaster 11-turn, 3.602-kilometre layout provides a stern test of drivers and teams. Its crown jewel is undoubtedly the Corkscrew, a blind downhill chicane featuring a 16% gradient that drops away just as cars approach its first left-hand apex. Laguna Seca literally translates as ‘dry lagoon’ thanks to its position at the bottom of a desert-like bowl flanked on all sides by mountains. This stunning backdrop, located on the Monterey Peninsula some 200 kilometres south of San Francisco, hosted its first California 8 Hours in 2017 after previously welcoming another series organised by SRO Motorsports Group, the FIA GT World Championship, in 1997 and ’98. Two decades after triumphing with its GT1 machines, will it be early Manufacturers’ Championship leader Mercedes-AMG that finally ends Audi’s recent dominance around Laguna Seca? A double #IntGTC podium at Bathurst has handed Mercedes-AMG an early eight-point lead in the Manufacturers’ standings. And, judging by its full quota of four nominated entries, that’s an advantage it fully expects to extend this weekend. GruppeM Racing has added a second car to its line-up after Maxi Buhk, Maxi Goetz and Raffaele Marciello finished third in Australia. They’re joined by fellow AMG factory trio Yelmer Buurman, Maro Engel and Luca Stolz who also raced but failed to score points at Bathurst. Meanwhile, championship regulars Strakka Racing are returning to #IntGTC this weekend after missing 2019’s season opener. The team’s two-car line-up includes reigning champion Tristan Vautier who clinched the 2018 crown by finishing third at Laguna Seca in October alongside former co-drivers Buhk and Engel. Buoyed by its maiden victory at Bathurst, Porsche heads to the California 8 Hours with two unchanged driver crews, the brand-new 911 GT3 R, and a pair of American customer teams eager to make their local knowledge count. Wright Motorsports are no strangers to #Cal8H where they finished fourth in October and also competed in 2017. Bathurst winners Matt Campbell, Dirk Werner and Dennis Olsen line-up for the Blancpain GT World Challenge America team with a seven-point advantage over Buhk/Goetz/Marciello, while Romain Dumas, Sven Mueller and Mathieu Jaminet are paired together with Park Place Motorsports who make their #IntGTC debut after claiming IMSA podiums at Laguna Seca in each of the last five years. Bentley left Bathurst ruing what might have been after both Continental GT3s had the pace to feature on the podium. A double points finish at least limited some of the damage before travelling to Laguna Seca where the M-Sport-run operation also demonstrated its potential in October, albeit without registering a headline result. The team has two new names above #108’s door this weekend after handing debuts to Markus Palttala and Lucas Ordonez. Both will benefit from valuable seat time alongside Maxime Soulet ahead of Bentley’s expanded Total 24 Hours of Spa assault in July. With Walkenhorst Motorsport’s M6 GT3 side-lined after less than an hour, BMW’s Bathurst assault rested squarely with Schnitzer who remained a front-runner throughout before finishing fifth following a Safety Car-interrupted final stint. Both teams return this weekend with unchanged driver line-ups for BMW’s first crack at #Cal8H. Augusto Farfus, Martin Tomczyk and Chaz Mostert will be eager to build on their solid start in Australia, while Laguna Seca offers Walkenhorst trio Christian Krognes, Nicky Catsburg and Mikkel Jensen the chance to re-set after their frustrating first outing. Nissan were another manufacturer with the pace but not the luck to feature higher on the Bathurst results sheet. Indeed, Josh Burdon’s last gasp fastest lap hinted at what might have been for KCMG, whose GT-R NISMO GT3s both spent time at the sharp end after working their way forwards in the opening hours. The Hong Kong team remains largely unchanged for theirs and Nissan’s California 8 Hours debut, with IMSA regular Oliver Jarvis leading the line in #18. The one addition concerns long-time NISMO factory driver and 2015 Blancpain Endurance Series champion Alex Buncombe who joins Katsumasa Chiyo and Burdon aboard #35. HubAuto Corsa and Ferrari will hope to get their Intercontinental GT Challenge campaign back on track at Laguna Seca after a troubled outing at Bathurst where an early accident ended hopes of the good result its practice pace suggested. Australian duo Nick Foster and Tim Slade return for their second outing of the season alongside Ferrari factory driver Miguel Molina who also raced with the team at the Suzuka 10 Hours in 2018. It’s fair to say things could have gone better for #IntGTC’s reigning Manufacturers’ Champions at Bathurst where its four entries scored only three points between them. However, if there’s one event where Audi would choose to kickstart its 2019 campaign then the California 8 Hours is surely it. Laguna Seca was certainly a happy hunting ground for Audi’s previous-generation R8 LMS GT3, which makes way for the new Evo version in 2019. Last season’s winners, Audi Sport Team Land, boast a crew with four California 8 Hours victories between them – lap record holder Kelvin van der Linde remains unbeaten in the #IntGTC era – while 2018 runners-up Audi Sport Team WRT are ready to unleash two-time Super Pole winner Christopher Haase. After skipping Bathurst, Honda makes its championship debut this weekend and, with it, extends the record for number of full-season manufacturers competing in a single #IntGTC round. While the previous-generation NSX GT3 contested 2017’s inaugural #Cal8H, Honda Team Motul’s Evo version will be fighting for points against seven rival brands. And Honda’s driver line-up suggests it means business. Renger van der Zande returns after competing for the Japanese marque at Macau’s FIA GT World Cup race in 2017, Bertrand Baguette has been a mainstay of Honda’s factory Super GT roster since 2014, and Mario Farnbacher raced the new Evo at the Daytona 24 Hours earlier this year. In GT4, three teams with existing California 8 Hours experience are battling for class honours. TRG returns with a Porsche 718 Cayman GT4 Clubsport and a driver crew headed by Spencer Pumpelly who finished second with the same team last season. The familiar trio of Jonathan Miller, Daren Jorgensen and Brett Strom are back with their BMW M4 after the latter two drivers also competed at Bathurst, while PF Racing’s Ford Mustang includes two-thirds of its 2018 #Cal8H crew: Jason Pesek and Jade Buford. Elsewhere, experienced Slovakian GT squad ARC Bratislava has entered the GT Cup class with a Lamborghini Huracan Super Trofeo for Miro Konopka, Andrzej Lewandowski and Zdeno Mikulasko.